New: The Sony A6000 is one of our favourite mirrorless compact system cameras, but how does it fare against its rivals in our lab tests? Take a look at our new, updated comparison charts for resolution, dynamic range and noise results against the Fuji X-T1, Olympus OM-D E-M1 and Panasonic GX7. It’s been a few months since Sony took the decision to officially drop the NEX moniker from its E-mount compact system cameras, renaming all of its interchangeable lens cameras with the Alpha brand, regardless of whether it is an A mount or an E mount (those formally known as NEX) camera. This means that some Alpha cameras (such as the A6000) take E mount lenses, while others take A mount lenses. Since then, the most exciting product to make its debut has been the Sony A7 and the Sony A7R, the company’s full-frame E-mount cameras which have been causing waves. Although their prices compare well with other full-frame cameras like the Canon 5D Mark III and Nikon D800, they are still a stretch for many. So – the solution? Sony has taken the decision to introduce what amounts to an APS-C version of the A7 in the shape of the A6000. As of now, two of the NEX lines will be discontinued – the Sony NEX-7, which was the camera aimed at the semi-pro audience, and the NEX-6, which sat at the top of the enthusiast range. Sony expects NEX-7 customers will head in the direction of the A7, while NEX-6 customers will be catered for by the new A6000. The A6000 has a similar look and feel to the A7. It features a newly designed 24.3 million pixel APS-C CMOS sensor. Like the device in the A7, the sensor has a gapless on-chip design, which is supposed to increase light collecting efficiency. The sensor also has 179 autofocus points, of which all 179 are used for phase detection, but 25 are also contrast detection points for the camera’s hybrid autofocusing system. This autofocusing system facilitates Sony’s claim that the camera has the fastest AF in the world, for those cameras with APS-C sized sensors at least anyway – and that claim stretches to DSLRs as well as other compact system cameras. With the A7 it also shares features such as Lock on AF, Eye AF and AF area settings. The camera is also equipped with Sony’s latest processor, the Bionz X, something which is also found in the A7/A7R. Sony claims this to be three times faster than the previous generation. Along with a faster speed, the Bionz X processor facilitates a maximum sensitivity speed of ISO 25600. On the back of the camera is a tiltable LCD screen, which is joined by an electronic viewfinder, which is the same 0.39 inch device as found in the recently launched RX10 bridge camera. As well as ditching the NEX name, Sony is ditching the NEX menu system, unifying menus across the entire range of Sony cameras – taking the lead from existing Alphas. This should mean that anybody familiar with any type of Sony camera can easily pick one up from higher (or lower) in the range and be able to get started with it straight away. As is starting to become pretty much standard, the A6000 comes complete with inbuilt Wi-Fi and NFC technology. Like other recent Sony cameras, it is also customisable with apps which can be downloaded to increase functionality – for instance, a time-lapse app is available. Battery life for the A6000 is around 310 shots, which doesn’t compare very favourably with a lot of DSLRs. The Nikon D3300, for instance, has a battery life of more than double that. Previous Sony cameras we have tested before (such as the A7R) have struggled to last a full day, so it will be interesting to see how the A6000 copes. 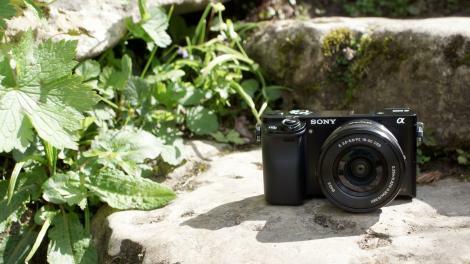 As standard, the A6000 comes with a 16-50mm f/3.5-5.6 power zoom – the same lens that is packaged with the A5000. You can also buy it body only, with a large range of different E mount lenses now available. As it’s a high-end enthusiast camera, perhaps the perfect all-round lens for this camera is the Zeiss 16-70mm f/4 optic, but that comes with a much heftier price tag. Sitting at the top of Sony’s enthusiast range of CSCs, the A6000 competes fairly closely with the likes of the Fuji X-E2, Olympus OM-D E-M10 and Panasonic G6. Taking a look at the A6000 there are a lot of similarities between it and the NEX-6 which it sort of replaces. Those photographers which appreciate a lot of dedicated dials and buttons will probably enjoy using a camera like the A6000 which has plenty of these available. The grip of the A6000 is ever so slightly more pronounced than on the NEX-6, making it easier to hold, especially when using the camera one-handed. There’s also a nice texture to the camera, which helps with getting a good grip on it, as well as lending it an air of quality. Where the NEX-6 had two stacked dials on top of the camera – one for changing the shooting mode (such as aperture priority, fully automatic or fully manual mode) and another for setting the aperture or shutter speed – depending on the mode you were shooting in, the A6000 has two dials next to each other on the top of the camera. While this takes up more room overall, it makes the experience of shooting easier and less prone to making accidental settings changes. The second dial (shutter speed or aperture) is very easily reachable by the thumb, which is handy for making quick changes. As with most other Sony cameras of late, most of the buttons on the a6000 are customisable. Sony knows that users like to set for themselves their most commonly used settings, so it’s nice to see that brought across here too. There’s also a type of quick menu available by pressing the function button – again everything that appears in this menu can be swapped out for something you find you use more often. A small custom button can be found on the top of the camera, useful if you want quick access to one particular setting often, such as wireless settings. It’s something we keep repeating, but we continue to be baffled by Sony’s decision not to include touchscreens on some of its CSCs, especially given it definitely has the technology elsewhere in the portfolio. It seems especially odd not to use one here on the A6000, when the lower specced and cheaper NEX-5R does use one. Including a touchscreen would make it extremely quick and easy to set autofocus points and to navigate through menus, but perhaps the company believes that more experienced photographers are not in favour of touch-sensitive devices. Setting the autofocus point on this camera is something which would be speedier with a touchscreen, but is not too bad if you set the right custom buttons. To make things quicker, I set the Focus Area to flexible spot. From here, you simply need to press the button in the centre of the scrolling dial on the back of the camera to bring up the focus point selection option. You can then use the directional keys to move around the screen. It’s worth noting that this is the default option for the central button when flexible spot is selected – if you’ve got it set to anything else, it won’t work in the same manner. The menu, having been made uniform to other Sony cameras, is much easier to navigate, with a sensible arrangement into different tabs for camera settings, custom settings, wireless settings, playback settings and other general settings, such as date and time. While viewing an image in playback, the Fn button becomes a dedicated Wi-Fi button allowing you to share images with your smartphone or tablet. You can either select a single image, all images or multiple images. Once you’ve set up the Wi-Fi connection with your phone or tablet once, you won’t need to enter a password again and it’s a reasonably quick process. If you have an NFC enabled device it’s quicker still, as all you’ll need to do is tap the two devices together to create a connection. Sony is producing some of the most exciting and consistently well performing cameras on the market. Having been extremely impressed with the A7 and the A7R, I was very keen to find out how, what amounts to an APS-C version of those cameras, performs. I’m pleased to report that the A6000 is capable of producing some fantastic images. Colours are wonderfully saturated, and although this can occasionally err towards over vibrance, generally, the effect is very pleasing. If you want to experiment with how colours appear straight from the camera, you can adjust Picture Styles. There are a number of presets, such as Landscape, Vivid, Clear or Monochrome, which can be customised, such as by adjusting the contrast. The good thing about Picture Styles is that they can be shot in raw format, so you’ll have a “clean” version of the image should you need it at a later point. The A6000 renders detail very well. Image smoothing starts to become evident from around ISO 400, but only if you’re examining at 100%, and only in some areas of the picture. Generally detail is kept well throughout the low-mid sensitivity range, only starting to become problematic for normal print size images from around ISO 6400. ISO 3200 is probably the highest I would feel comfortably shoot with if I wanted to make prints of A4 or below, but I’d go up to ISO 12800 for sharing images online at small sizes. Examine images taken at ISO 1600 and you’ll find areas of the image have a slight painterly effect, but it’s not noticeable at smaller, or normal, printing sizes. The camera’s metering system does a good job in general at helping to produce accurately exposed images. However, I have found on several occasions, the A6000 is prone to underexposure, meaning you’ll need to dial in some exposure compensation (if shooting in aperture priority or shutter priority) to get a balanced image. This is particularly problematic if you’re shooting something with high contrast, and it can help to switch to spot metering. The automatic white balance is decent at reproducing accurate colours, but some artificial light sources can confuse it slightly, causing it to produce warm or yellow toned images in some circumstances. If you’re finding this to be particularly problematic, you can switch to a more appropriate white balance setting, such as Incandescent. Sony has been very keen to push the fact that the A6000 has the fastest autofocusing speeds of any APS-C format sensored camera. Although I don’t think the speeds match those of the smaller Micro Four Thirds format, it doesn’t seem to be far off, and, especially in good light, focusing speeds are very impressive. When light levels drop, the camera will hunt around a little longer, but it’s rare for a false positive focus to be displayed on the screen, and generally I have been impressed with lower light speeds – it’s definitely an improvement over the NEX-6. Along with Picture Styles, you can also choose to experiment with Picture Effects. Unlike the Styles, you can’t shoot using Effects in raw format, so you’ll need to switch to JPEG only shooting first, and it also means that you’ll be stuck with whatever filter you use. It’s a shame that these can’t be shot in raw format, or raw and JPEG format simultaneously, like you can with Olympus or Panasonic cameras. Nevertheless, there is a good selection available, and they’re worth experimenting with to see if you particularly like any – my favourites are Toy Camera and High Contrast Monochrome. As standard, the A6000 is packaged with a 16-50mm f/3.5-5.6 lens. It’s a good all-round performer for your first optic, giving you a good range of different focal lengths, and you can also get some pleasing shallow depth of field effects while using it. If you can stretch to the Zeiss 16-70mm f/4 optic, it’s a worthwhile investment, as that extra reach can be useful, and generally images shot while using it are sharper. Other E-mount lenses, such as the 50mm f/1.8 optic, are also worth investigating, and it’s nice to see such a wide range available now. Battery life doesn’t seem to be quite as bad as the A7/R, probably due to the smaller sensor size, which is positive news. You’ll probably still need to purchase an additional battery if you’re planning on taking the A6000 on any long trips though, just to be on the safe side. As part of our image quality testing for the Sony A6000, we’ve shot our resolution chart. For a full explanation of what our resolution charts mean, and how to read them, check out our full explanation of our camera testing resolution charts. Analysis: The A6000’s JPEG resolution (top chart) is the highest of this group, right up to ISO 3200. After that, the Fuji X-T1 is a little better, but this will only show up if you do a lot of photography in very low light conditions. A resolution score in the high twenties and nudging 30 is really good for an APS-C sensor. The raw results (lower chart) show a similar pattern, though here the X-T1 offers slightly better resolution. Both are well clear of the two smaller-format Micro Four Thirds cameras, the Olympus OM-D E-M1 and the Panasonic GX7. Here are crops from our test chart shots so that you can see the results directly. Full ISO 100 image, see the cropped (100%) versions below. Again, we compare the Sony A6000 with the Fuji X-T1, Olympus OMD-EM1 and Panasonic GX7. Analysis: The A6000 puts in a reasonably consistent performance in terms of signal to noise ratio, sitting at, or near, the top of the chart here. At the highest sensitivities, it beats all of the other cameras on test, while, at the lower end of the scale it is very closely matched by the Fuji X-T1. Analysis: At first glance, this graph appears to show that the A6000 is the worst performer from the group for raw signal to noise ratio performance. While it’s true that it’s the lowest on the chart, this indicates that the Sony is favouring detail reproduction over noise reduction. Shooting in raw format allows you to apply your own noise reduction, depending on what you prefer. We also shoot a real-life subject under controlled laboratory conditions to show the noise levels across the ISO range for both JPEG and raw files. Dynamic range is the camera’s ability to record extremes of brightness without clipping shadow or highlight detail. It’s measured in EV (exposure values). Analysis: For JPEG dynamic range results, the Sony puts in a good, consistent performance across range, only dipping at the very highest sensitivities. It is not quite matched by the Olympus OM-D E-M1 across all but ISO 100. The Fuji X-T1 is technically the worst performer on this test, but, this is a reflection of the Fuji’s tendency to producer higher contrast images. Analysis: The A6000’s raw files offer more dynamic range than its JPEGs, but its rivals show an even greater improvement, so in this test it is beaten by the three other cameras, being closest to the Fuji X-T1. The camera’s metering system generally does a good job of producing well exposed images, but sometimes you might find you need to dial in some positive exposure compensation. Skies are represented well, not seeming to be plagued by inaccurate cyan colors. Images appear bright and punchy straight from the camera. You can change Picture Styles to give the contrast a boost, which works well for certain subjects. This has been shot with the Vivid Picture Style. The A6000 is capable of resolving lots of detail. The A6000 is ideally matched to the Zeiss 16-70mm f/4 lens. You can also shoot in monochrome using Picture Styles. When you shoot in Picture Styles, you can also shoot in raw format, meaning you have a clean version of the image down the line should you need it. The A6000’s metering system has done a good job of preserving the highlights and shadow areas of this image. Out of focus areas are rendered beautifully by the A6000. A wide range of lenses is now available for the Sony E-Mount. This was taken with a 30mm f/3.5 macro lens. A number of different Picture Effects are available – these can’t be shot in raw format. Alternatively, you can shoot using different Picture Styles, which are available when shooting in raw format, and can also be customized. Once again Sony has brought something intriguing and exciting into the compact system camera territory. Those who spent the latter part of 2013 gazing longingly at the A7, balking at the high price tag, will probably be especially be tempted by the A6000. This camera comes very close to being the perfect compact system camera. It’s so close it’s frustrating. A big part of this is the fact that setting the AF point is just too laborious, especially for a camera of this calibre. While it may seem like a small issue, it can slow down the process of taking pictures, and, that’s pretty much the most important thing. I remain hopeful that Sony might be able to correct this problem with a firmware upgrade, as it’s much easier to set the AF point using the A7/R. Focusing speeds are excellent though, only dropping a little when shooting in low light. On a more positive note, the other elements of using the camera are very good. It’s nice to be able to customise the various buttons to control what you want them to, while the scrolling dial for altering aperture and shutter speed is nicely reachable by the thumb. Although the screen is, annoyingly, not touch-sensitive (which would have helped with the AF setting problem), it is at least tilting, which makes it useful for shooting from awkward angles. The electronic viewfinder is also great, being bright and clear and with an eye sensor which makes using it a seamless transition. It’s great to see Sony has revamped the menu system, giving all of its camera a unified look. It’s a simple and easy to use menu, with everything where you’d generally expect it to be – it’s certainly a welcome break from the confusing, and frustrating at times, menu system of the NEX cameras of old. Coming to perhaps the most important aspect – image quality. It’s great in the majority of situations, with the A6000 producing detailed, vibrant images. Low light performance is also good, with low noise and high detail, and not too much evidence of image smoothing except at the very highest sensitivities. The 16-50mm f/3.5-5.6 kit lens is a great all-round performer too. This is the kind of camera that you’ll likely want to buy additional lenses for, and happily, Sony has a great range available now. There’s a lot to like about the A6000, not least the tilting, high resolution screen and the excellent viewfinder. Aside from the excellent image quality, probably the best thing about the A6000 is the way that all of the buttons, and the function menu, can be customised to suit your needs. It’s a great way to work and means you can dump those settings you never use, and have quick access to the ones you use often. It’s pretty annoying, for a camera of this standard, that there’s no quick way to set the AF point. It really shouldn’t be that difficult, or time consuming, to change the point, and if you’re someone who likes to do that often, it can quickly make you grow tired of using the camera. It’s something we mention often, but the lack of a touchscreen makes even less sense here. Sony has this technology readily available in its portfolio, so it remains a mystery why it is insistent on leaving it off its high-end products, especially when its biggest rivals, including Samsung, Panasonic, Olympus and the newest Nikon CSCs, are all embracing it. Sony has come within touching distance of creating the perfect compact system camera, but it’s not quite there yet. Fantastic image quality, a small and sleek system, customisable buttons are all great to have, but there are a couple of niggles keeping it from true greatness.